The FourCoursemen of Athens, Georgia, run an underground supper club with a cult following—and they never make the same thing twice. F&W’s Emily Kaiser reports on their best and simplest recipes. It’s amazing what can happen when two guys who just love to cook team up. 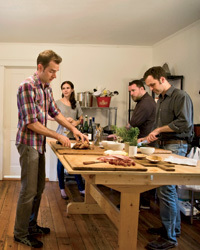 Damien Schaefer and Randolph Dudley, both graphic designers, started meeting at Schaefer’s house in Athens, Georgia, to try new recipes. They had such a good time, they talked about starting a cooking show. But then, three years ago, they had a better idea: a supper club that would allow them to share their experiments—duck hot dogs, cuitlacoche (corn fungus) ravioli. After enlisting two more friends, they began making multicourse dinners for 24, soliciting reservations online and accepting donations. They called it The FourCoursemen. Their dinners developed a cultlike following and began selling out within minutes of being posted. Today The FourCoursemen is comprised of six people, including a wine pro and three professional chefs who like to experiment in their off-hours. The group has a few unspoken rules: They never make the same thing twice, they never plan a dinner more than a few days out and they don’t announce the menu until the evening starts. “We like to keep it punk rock,” explains Schaefer, who designs websites for bands like Athens natives R.E.M. Some dishes are amazing, others more interesting than delicious, but the dinners are always a blast. Athens is an unusually creative and tight-knit place; sometimes it seems as though everyone knows each other. Tonight’s dinner is in honor of artist Susan Hable, who co-owns the textile company Hable Construction and has just moved to town. Hable is known for simple, nature-inspired designs, and The FourCoursemen have planned an equally simple menu. The first course is roasted spaghetti squash tossed with pine nuts, queso fresco and fresh tarragon. It’s great with a Portuguese Vinho Verde from Gosford Wine, a shop owned by Athens star chef Hugh Acheson.